So, you’ve come home with one or two (or ten!) small tomato plants. Now what? How do you ensure you will have a bumper crop of tasty tomatoes? Tomatoes absolutely thrive in sun. 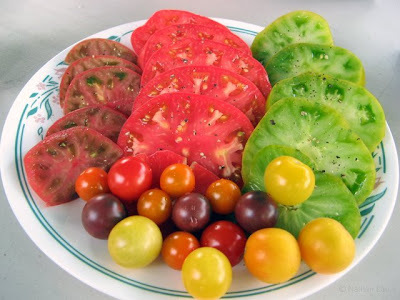 Most tomatoes have to have at least six hours of direct sunlight a day to do well. You want to be sure to plant your tomato in a spot where it will receive the most sunlight. More sun means more photosynthesis which means a sweeter tomato! One of the biggest mistakes people make is to plant their seedlings too early. Spring can be surprising. One day it is warm and sunny, while the next night you could get a freeze or even snow! Wait until the soil warms up and all chances of frost are passed before putting the plant into the ground. In Santa Clara County, the last frost could be as late as April 15. What’s the hurry? Let your plants sit for a few weeks more while you prepare the garden beds for them. Tomatoes are heavy feeders. That means they take up a lot of nutrients from the soil to make those tasty tomatoes. They grow long root systems that travel far in search of nutrients. You want to have the healthiest soil possible for them to grow in. If you’re growing them in a pot, it has to be no less than 15 gallons. Fill it with premium potting soil (we like the OSH premium brand manufactured by SunLand). Plant only one tomato per pot so the roots don’t get crowded. If you’re growing them in the ground, make sure to mix a lot of compost into the soil. If you don’t have your own compost pile, you can use composted manure. We actually dug our beds 12 inches down to loosen the soil and amend with compost. Set the tomato plant down deep. That means bury it so that only a few sets of leaves are sticking up above the ground. There are small hairs all along the stem of the plant that will actually turn into roots and give the plant a stronger root system if you bury it that deep. Don’t crowd the plants – leave at least two feet between plants to ensure they all get enough space to grow. Mulch the bed so that the soil will retain moisture and moderate the temperature and water supply swings (more on that later). Most tomatoes are vines that will grow and grow all season long. In our yard, the vines can get eight to ten feet long before it is time to pull them out at the end of the season! So forget about buying those dinky little three-ring tomato cages – they’ll be overwhelmed and falling over before the first fruit are ready to be picked! Keeping the vines upright will allow you to pick all the fruit and also prevent disease from moisture buildup caused by lack of airflow. 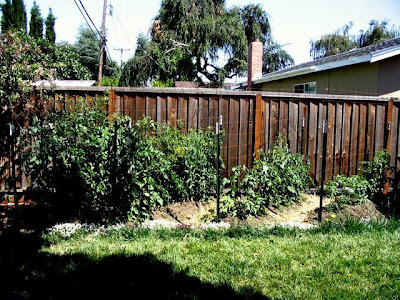 In our yard, we’ve tried a few ways of supporting our growing tomatoes. 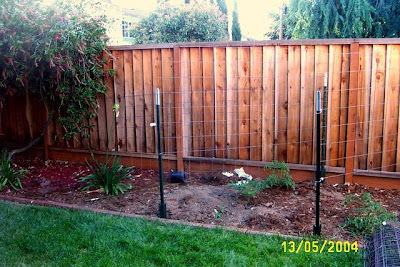 One way is to use T-stakes and wire mesh panels as a fence that allows the plants to climb up in one row. I like it because it makes it easy to walk between rows and pick tomatoes from both sides. We tie the vines to the fence using strips of nylon pantyhose. Another method of support that is popular is to use Concrete Reinforcing Wire (“CRW”) to build cages two-and-a-half to three feet in diameter. 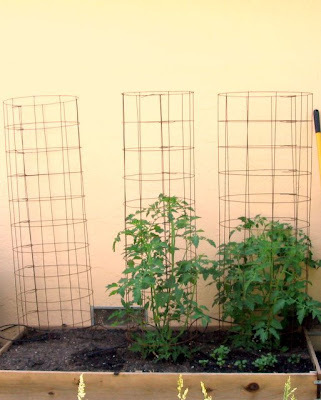 You set the cage on the ground around the newly buried tomato plant and secure the cage with a deep stake or two to help prevent it from falling over later in the season. You can keep the vines neatly inside the cage until it eventually grows out from the top and spills over. When you first plant the tomato, you want to water it frequently. How frequently depends on the type of soil you have. Give it water when the soil one inch down feels dry. In pots or fast-draining soil, this could mean every day. In clay soil or heavily mulched soil, this could mean every three days. Be sure to water only the roots and not the leaves, so as to prevent disease caused by moisture. Water during the morning hours, because the plant is going to need that water in the sunny, growing hours of daylight. After a hot day, a wilted looking plant may not actually need water – after the sun goes down and things cool off, the plant will perk up again. When the fruits begin ripen, however, you want to cut back on the watering. The reason is this: too much water will produce a plump tomato that is mealy and diluted in flavor. Your aim is to concentrate the flavors by withholding water. If your plant’s root system is strong enough, the plant will find enough water to survive. By the end of July, we’ll be harvesting a few tomatoes a day. By mid-August, things will really be pumping. Hopefully, you will have chosen some late varieties as well as early ones so that you will be enjoying tomatoes into October! If you have questions about growing tomatoes, feel free to leave a comment and Annie will answer them for you. 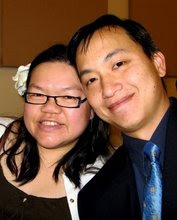 >Great Blog and very well presented. So I am coming back. Started a video Series on Your Tube. there will be Weekly additions. Stop by , watch, make a favorite, subscribe and let’s have Fun. What is an Old man to do with his Time? SWIFT Theme by Satish Gandham. 55 queries in 0.801 seconds.